Continuing our look at the current national team members, today we will look at the new seniors. Bailie Key at the 2015 Jesolo City Trophy. Photo by Philippo Tomasi via USA Gymnastics. Key has dominated the junior ranks over the past two years, winning every competition she entered with a great margin to spare. She does not have an incredible stand out event, but rather is incredibly clean and strong on all four events. She placed second to Simone Biles in the all-around and to Kyla Ross on uneven bars at the recent City of Jesolo Trophy. Dennis had a strong junior career, placing at the top of the field in numerous competitions. However, she has yet to make her senior debut due to injury. Dennis is a strong all-arounder, as well as incredibly powerful on floor and has a great bar routine as well. Emily Schild at the 2015 City of Jesolo. Photo by Philippo Tomasi via USA Gymnastics. Schild showed incredible promise in 2013, but battled injury in 2014. She made her international debut at the 2015 City of Jesolo Trophy. Her strongest events are vault and floor. Megan Skaggs, training at the City of Jesolo. Photo by Philippo Tomasi via USA Gymnastics. Skaggs has been in the top ten over the last few years in the junior division, especially on floor. She finished eighth in her senior debut at the all-around at the recent City of Jesolo Trophy. She has gorgeous form and catlike landings. The Junior Olympic program is an important stepping stone to NCAA and elite level competition for gymnasts all around the nation. Des Moines, Iowa played host to this year’s U.S. Women’s Junior Olympic National Championships. The top four all-around gymnasts in each age division automatically qualify for the 2015-16 U.S. Women’s Junior Olympic National Team. These are gymnasts to keep an eye on to make a splash in the elite and NCAA scenes. The national team members, by age division, are listed below. Jordyn Weiber has officially retired from elite level gymnastics. And Kyla Ross never left. That leaves three of the Fierce Five to discuss their possible impact in 2015. Aly Raisman, 2015 City of Jesolo Floor Finals. Photo by Filippo Tomasi via USA Gymnastics. Raisman returned to competition for the first time since the 2012 Olympics at the City of Jesolo Trophy in March. She showed incredibly strong training sessions before the competition. In the qualifications, she posted the third highest score on beam, even though it was not nearly as strong of a routine as she had shown in training. Though she has been training and amanar, she just competed a double twisting yurechenko. It was a clean vault that showed definite potential for her amanar in the future. She seems to have improved on bars. She also qualified for event finals on floor,and ended up with the bronze medal on the floor and in the all-around. Gabrielle Douglas. Photo by Filippo Tomasi via USA Gymnastics. Douglas also made her competition comeback appearance at the 2015 City of Jesolo Trophy. She came in fourth in the all-around and tied for third on beam and bars and fourth on floor. Douglas looked great in training, and her progress in training seems to be in an incredibly positive direction. Maroney has disclosed on social media that she has struggled both with adrenal fatigue and depression over the last year. She has also talked about her fear of getting injured again. Though she continues to refer to her training, and her dreams of competing in the 2016 Olympics, it is unclear on where she is actually at in her training and if she will return. In 2014, Simone Biles is without a doubt the most dominant gymnast in the world. She does some of the most difficult gymnastics with such ease, it is hard to comprehend just how incredible it really is. She defies the normal “rules” on floor, ending her routine with a pass that many gymnasts start with, and doing it with so much bounce to spare that you honestly wonder how many flips and twists it will take to nail those feet to the ground. But Biles is not one to follow the rules. Most gymnasts present a serious demeanor on the floor, not watching other competitors routines and zoning in on what they have to do. Though there is nothing wrong with that, it’s just not her style. Biles is all smiles and energy on the competition podium right up until she starts her event and again immediately as her feet touch the floor for her dismount. Except floor, where the sincere grin just never stops. Between routines she can be found chatting with other teammates, cheering on fellow competitors and laughing with her coach. 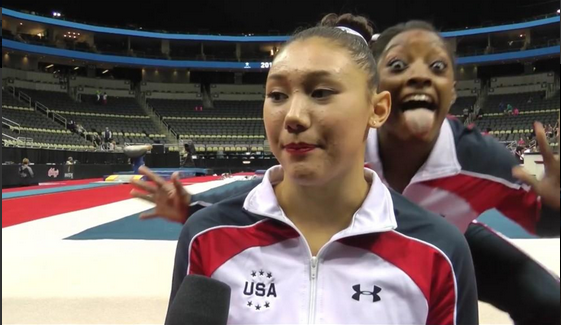 Simone Biles videobombs Kyla Ross’s interview with USA Gymnastics. Her twitter feed reads like a memoir to all the people she loves and can’t live without. So though Biles is miles ahead of her competitors when it comes down to the score, she is determined to walk the Road to Rio step by step and arm in arm with her U.S. teammates. This bouncy bundle of joy is changing all the rules about how to compete gymnastics. And giving many people in the world a lesson on how to live life. In March of 2013, Jazmyn Foberg (Jazzy as she is affectionately known) made a decision that would change the entire trajectory of her life. She started training with Maggie Haney at MG Elite. And now she finds herself topping the junior division scoreboard as she heads into the second day of competition for the P&G U.S. National Championships. Jazmyn Foberg of MG Elite at the P&G National Championships. Photo by John Cheng via USA Gymnastics. In this case, words like improved don’t even begin to capture the monumental progress Foberg has made. Last year at the Secret U.S. Classics, she placed 26th and missed out on qualifying for nationals. Her teammates Laurie Hernandez and Ari Agrapides went on to phenomenal success at nationals, where Hernandez took the all-around silver and Agrapides won the national vault title in the junior division. “I think it was very good for Jazzy to see Laurie & Ari have such successes last year. I think that Jazzy became very motivated after watching them go to camp after camp and even watching Laurie have International assignments. I feel like this was like dangling a carrot in front of Jazzy. It motivated her and this is what she wants and is willing to work towards,” said Haney. Foberg’s hard work began to pay off earlier in 2014, where she won the all-around and the uneven bars at the 2014 Buckeye Elite Qualifer. She continued to gain speed at the American Classic in Huntsville, Texas where she won the all-around, vault and bars. Then there was the 2014 Secret U.S. Classic. Oh what a difference a year can make. After a great showing at the national training camp, Foberg was one of the junior gymnasts selected to compete in the senior session. Foberg took the early lead in the competition, and as a result was featured twice in the NBC broadcast. For a junior elite gymnast, that is some pretty heady stuff. But Foberg took it all in stride. As it seems she always does. Haney said of Foberg, “I would describe Jazzy as a very “chill” kid. She is level headed and I never have any surprises with her. Inside the gym, Jazzy is extremely focused and very good at making corrections and feeling what she is doing.” Foberg went on to place 5th in the all-around at Classics. Jazmyn Foberg, featured on the live broadcast of the 2014 Secret U.S. Classics as a junior. Foberg came into nationals looking confident and ready to compete. Nia Dennis leads the junior field in difficulty, and has generally been considered the favorite to win after strong international performances earlier in the year. Right behind Dennis has been Norah Flatley, Chow’s latest star who has excellent execution and a stellar beam routine. And then there is Jordan Chiles, who took everyone by surprise winning the Secret U.S. Classic earlier this month. Foberg came into the meet with the second highest difficulty planned, and a strong desire to follow in the footsteps of her teammates and stand on that medal podium. She started out the first day of competition with a strong double twisting Yurchenko that scored a 14.6. This gave her the early lead after rotation one, a position she only relinquished for one rotation the rest of the day. Moving into her strongest event, Foberg put up the second highest bar score of the competition; but a strong vault from Dennis pushed her into second half way through the meet. With her two strongest events behind her, Foberg was going to need to put up solid routines and mistakes from the other girls to regain the lead. And that is just what she got. Dennis performed a beautiful bar routine, but fell on her dismount. Flatley had a shocking fall on beam, but still scored a 14.4 with her incredible routine. Foberg remained focused despite all the falls around her and hit a solid beam routine, putting her back in the lead. A lead she was able to hold onto in the last rotation as Dennis had a second fall. Whether or not Foberg is able to hold onto her lead tomorrow in the second day of competition, it is clear that she has legitimately come into her own as one of the juniors to watch on the Road to Rio. Her strong all-around abilities, cool and consistent performance personality, and her great bar work firmly ingrain her into the mix of gymnasts who are strong contenders for 2016. Mackenzie Brannen and McKenna Kelley tied for first with a 38.425. Here is a little more about them and each of their routines. Floor Finalists – Start List, Qualification Scores and Videos, Predictions. The Women’s World Championships will wrap up tomorrow with the Floor Finals. How this week has flown! You can watch them live here. Event finals start at 8:30am EST. I think that all of the gymnasts performed well in qualifications. I don’t think there is someone in the field that can do significantly better than they did, and I think the top girls are all pretty solid competitors. So I am actually going to go with the order that they qualified in. The Uneven Bars Final was packed with talented girls and difficult routines. Unlike the vault finals, a number of different outcomes seemed likely. In fact, the only thing I got right on my bars predictions was Kyla Ross in silver. Gymnastics Coaching tweeted: “looks like I’m going to be eating my words. … I’m the guy who said Kyla couldn’t medal on Bars.” And then I remember that I was of the same opinion earlier this year. I couldn’t be happier to be wrong. And I need to remember to wait til closer to competitions to form those opinions! 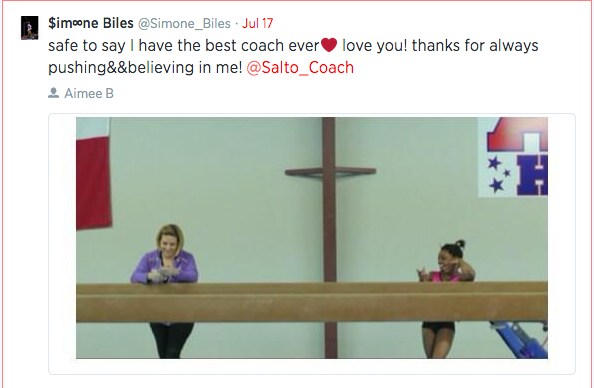 Especially because Simone Biles almost medaled in bars! The Final started off with Yao Jinnan. This title was hers to win or lose. If she hit, it was unlikely that anyone could beat her. But as has so often been the case with the Chinese in finals, she fell. Granted, the skill she fell on is crazy hard. But she has hit it again and again. It was so disappointing. She held herself together well until the finals were over, when she burst into tears. Huang Huidan was up next, and put up an excellent routine. One Chinese coach has said in the past, if one of us falls, we all must fall. She seemed to break that tradition by staying on the bar and hitting a clean routine. After her came Rebecca Downie. With high swinging bars and an innovative routine, Rebecca is a crowd pleaser. However, she too succumbed to the pressure of a World Championship Finals and fell off at the end of her routine. Sophie Scheder followed with a clean, beautifully swung routine. She has such great lines on bars! She is a pleasure to watch, but was not able to challenge for the top spots. 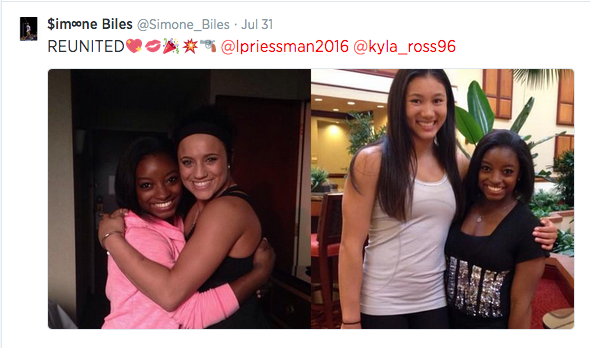 Simone Biles came up next. I am still getting used to the fact that Simone qualified for a bars final. And she lived up to the spot, hitting her routine! Kyla Ross followed Simone, putting up her ever consistent, ever beautiful bar routine. She bested everyone except Huang. Going into the last two gymnasts, could it be that America would go two, three; that Simone would medal on bars? Not if Aliya Mustafina had anything to say about it. Aliya threw her heart into it. It was enough to overtake Simone, but not Kyla and Huang. Last up was Ruby Harrold. Ruby has an innovative, interesting routine! She performed it well, but it was not enough to change the medal standings. In the end it was Huang, Kyla and Aliya. Kyla and Simone both talked to the press in the mixed zone about being pleased with what they did and how they needed to go back and rest up for tomorrow.